Superminis (referred to also as B-Segment cars) were once cramped, stark, slow and noisy. Those days are gone. Levels of comfort, cabin space, performance and refinement have increased to such an extent that for many people, there is no need to move beyond this segment unless you are seeking greater cabin space. Desirable features such as air-conditioning, power windows, locks and mirrors are either standard or optional on all of the cars in this category, with some cars offering luxury features like leather seating, navigation systems, Keyless Go and heated steering wheels, as options. Active safety features such as autonomous emergency braking, forward collision warning and radar cruise control are increasingly available in cars in this segment. There are two key new entries for 2018, the Hyundai Accent and the Kia Rio. Both share the same platform and mechanicals but spin the shared elements into different cars. Nissan introduced an all-new larger Micra in Europe for the 2017 model year but Canada continues to get the previous-generation car for 2018. The new Micra's platform, if not its outer form, is available underneath the new Kicks tall hatchback, which is to be marketed as a crossover, despite being exclusively front-wheel drive; which led the car to be covered in the Supermini category this year. Ford introduced a new-generation Fiesta in Europe for 2018 but Canada continues to get the previous generation for one more year, after which the nameplate may be discontinued in this market. No changes of note for the Sonic in its EIGHTH year on the market. Hatchback model: the True North package contains much of the equipment of the Premier, the 1.4L turbo and a six-speed automatic transmission, for a good price. 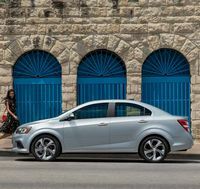 The Premier hatchback is the only Sonic that offers Driver Confidence package that includes forward collision and lane departure warnings as well as a reverse parking sensor. The sedan is proposed in a single LT trim. An LT sedan sells for $1000 less than a similarly equipped hatchback. The $10,095 manual trasmission 1LS base model tested by the APA was a revelation. The 1.4L four is smooth, flexible and surprisingly punchy. While clutch engagement is a bit late in its travel, the clutch is light and easy to modulate. The gearchange is not the last word in precision but is nicely weighted and never fails to find the gear selected. Overall gearing is a bit on the high side, which permits low-rev cruising but does demand you drop and gear for even modest hill. Steering lacks in road feel but is quick and nicely weighted. The brakes work well but could use greater initial bite. Some controlled lean is experienced while cornering but handling is sound and is allied to a surprisingly supple ride for a car with such a short wheelbase. Driven briefly, the CVT in a 2LT works unobtrusively and keeps revs low while crusing at highway speeds. Wind noise and road noise were much lower in the new Spark than on its predecessor, but tire noise borders on intrusive. Unlike its avant-garde predecessor, current Spark drivers face a clear, very conventional guage package. Even on the base model, the top-centre of the dash is dominated by a large touch screen, below of which are simple audio controls as well as a straightforward three dial climate controls. Seat fabrics and other cabin trim are more attractive than most people will expect for $10,095. Some APA testers thought the front seats to be a bit on the small side, they were quite deeply padded and acceptably supportive. Access to the rear seat is better than expected and rear seat space (especially on the passenger side if the front passenger gives up some room for those in the rear) is surprising for such a small car. Trunk space, while not copious, is tall and regularly shaped. The sound quality of the base two-speaker audio system in the Spark 1LS was impressive and even the base car is equipped with Android Auto/Apple CarPlay. With a base MSRP of $10,095, the Spark is the cheapest new car available in Canada. Even the base model is equipped with a rearview camera and a large dash touchsreen. The nearly $4000 price jump between the base 1LS manual to the 1LS automatic is partially explained by the transmission and air conditioning, which is valued at aroung $2500. The 1LT upgrade, which includes a full power group (windows, door locks with a remote, mirrors) and alloy wheels, is equipped the way most buyers want and is very good value. The 2LT range topper is priced to reflect the value of its contents, which includes a forward collision and lane departure warnings. 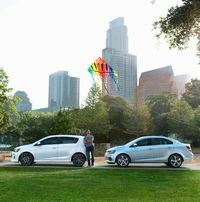 However, larger vehicles such as the Hyundai Accent and Kia Rio start to look pretty compelling compared with a fully-loaded Spark. HIgher than average depreciation is expected. Leasing is not worth considering for 2018. The 500 enters its sixth year with few changes other than a wider-ranging Pop trim level, the elimination of the previous Sport model, as well as the disappearance of the low-pressure turbo variant. 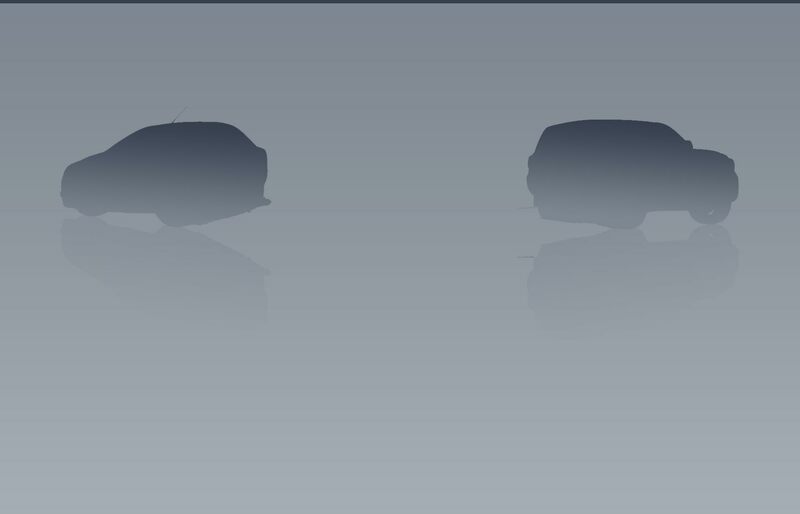 FCA says there will be a 2018 500 but nothing has been announced as of February 2018. The normally-aspirated 1.4L engine sounds gruff and strained much of the time. The six-speed automatic transmission permits mechanically relaxed cruising and works well enough in the countryside but poorly chosen lower gears, bad programming or a combination of both result in a car that always seems to be in the wrong gear in the city. Downshifts are eager enough. Putting the transportation in "Sport" mode leads to less in-town lethargy, but also increases revs at highway speeds. The steering, which is light and quick for tight turns and parking in town, firms up at higher speeds, but lacks feedback. The firm ride has a resilience that absorbs most of the harshness from large bumps. The 500's diminutive size confirms a certain agility but handling demonstrates considerable lean in curves and lacks any sense of fun. The 500 is pushed around by crosswinds. Firm, progressive brakes with a high ABS engagement threshold. The Abarth's fizzy 160 horsepower turbo engine accelerates briskly. Pronounced wind noise. Clear instrumentations. The very attractive cabin features a large exterior-body colour insert on the dashboard. The radio controls, previously diabolical, and now straightforward. Very good audio system with deep lows and crisp highs. The satellite radio signal cuts out frequently. Efficient heating and defrosting. The air conditioning was not as cold as desired on really warm days. The front seats are deeply padded but some found them a bit firm, with the backrest being too firm and flat for some drivers. Low windshield header. The high roof permits easy cabin access, and while rear legroom is tight, headroom is adequate and ingress/egress is better than on a number of other small cars. The rear seat head restraints are poorly placed and very uncomfortable. The massive sunroof of the cabrio model seals tightly and causes little wind noise. The top itself opens and closes easily and includes an interlock that precludes the top opening fully above a certain speed. Little wind buffeting with the top fully open up to around 100 km/h. When fully retracted, the roof blocks the view of the rear view mirror, but the substantial door mirrors are helpful. On the hatchback, the trunk is tall, regularly shaped and reasonably roomy for such a small car. The trunk on the cabrio has a small opening but the space inside is quite decent and is not compromised by the folding top. The 500's look was inspired by the Nuova 500 of 1957. Fiat's new car was styled by Frank Stephenson, the same designer who penned the first BMW MINI. The 500 is beautifully detailed and extremely chic. Labelled a cabriolet, the open-top 500, which has a cloth roof that unfurls electrically between fixed roof pillars, has traditionally been referred to as a "transformable". A normally-aspirated 1.4L four, as well as a 160 horsepower 1.4L turbo, are available. Two transmissions, a five-speed manual and a six-speed automatic, are offered. Sales of the originally 500 have dropped precipitously and the 500X, the car that needed to sell well to consolidate the Fiat franchise in Canada, failing to stir buyer interest, Fiat may not have a long-term future in Canada. The Pop trim level now offers a broader range of optional features, including air conditioning, which will make moving up to the Lounge model unnecessary for many buyers. If you opt to move up to the lavishly equipped Lounge, its price is much less than the value of its content. When additional standard features of the Abarth variant are accounted for, its extra 59 horsepower costs a very reasonable $1300. The convertible is very expensive given that is essentially a gigantic cloth sunroof. Poor resale value. The 1L turbocharged three-cylinder engine has been discontinued. Though a new-generation Fiesta has been on sale in Europe for up to a year, Canada continues to get the previous-generation car, which is now in its EIGTH year. The nameplate will likely be discontinued for the North American market at the end of 2018. Those few buyers picking the Fiesta (fewer than 2000 sold in 2017) can opt for the sedan and hatchback body styles at the same price. The base S trim is equipped with air conditioning but is not offered with automatic transmission or a power group. The SE trim upgrade, with expected convenience features like power windows and cruise control and appearance items such as alloy wheels, is priced to reflect the value of its additional content. With leather upholstery, a sunroof and navigation, the Titanium range topper is luxurious and comprehensively equipped, but is a bit expensive for what you are getting, at over $25, 000, there are a lot of tempting alternatives to attract buyers. The high-performance turbo ST is undermined by the lack of an automatic transmission but is a formidable sporting package for the price. Poor value leasing. At just over $15,000, the base DX trim, lacking air conditioning or automatic transmission, even as options, is offered simply to be able to advertise the lowest possible base price. The next model, the LX, has air conditioning but does not offer automatic transmission, taking it out of the running for most buyers. The price gap between the DX and the LX is roughly $1000 higher than its extra content can justify. Compared with the LX, the LX HS, with automatic transmission and the Honda Sensing active safety suite, is a bargain. The Sport HS trim upgrade is priced to reflect the value of the additional equipment in the upgrade. The EX HS and EX-L Navi HS trim ugrades are good value but at nearly $24,000, the EX-L Navi HS makes a number of larger cars look like compelling choices. Unless you live in a congested urban evironment where the tidy footprint and spectacularly space-efficient body of the Fit will serve you well, you can lfinance or lease a Honda Civic LX for roughly the same monthly outlay as a Fit LX HS. The 1.6L four is strong, flexible and, unless really extended, when is gets a touch raucous, is smooth and quiet. The upshifts of the conventional six-speed automatic transmission are imperceptable, downshifts are swift when desired and it permits low-rev cruising. The Accent's steering is quick, and nicely weighted but it reveals little of the road beneath its wheels. Handling is crisp but at the expense of ride, which is very abrupt, to the point of being a deal breaker for some buyers. Wind noise is low and road noise itself is subdued but the overly firm suspension is clunky over large road imperfections. Braking is strong, with a reassuringly firm pedal with no lost motion. Hyundai Canada showed the 2018 Accent at the Toronto auto show in February of 2017 but the car actually went on sale a year later. 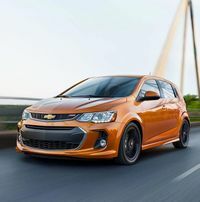 While a sedan is available in the U.S. and Canada, the hatchback body, the overwhelminingly most popular body style in Canada, is exclusive to the Great White North. No pricing details are currently available. The second-generation Veloster goes on sale in mid-2018. Good reliability predicted, like the Accent it is based on. The dual-clutch automated manual transmission and the turbo engine are unproven and some complaints have been received about unsolvable issues with previous the six-speed dual clutch transmission. Without available air conditioning or automatic transmission, the $14,995 base LX trim is listed simply to advertise a low MSRP. With automatic transmission, air conditioning and cruise control, the $17,995 LX+ version,is the defacto base model for most buyers. The EX trim upgrade, with a sunroof, alloy wheels, telescoping steering wheel, automatck temperature control is very nicely equipped but at about $21,000, it is getting expensive for a car in this class. The value of the EX Sport trim is a mystery but the range-topper EX Tech Navi, while comprehensivly equipped, but its price, nearly $24,000, opens up a lot of excellent compact cars that may have less equipment but are cars that can serve as the sole vehicle for a family of four. Poor lease value at the beginning of the 2018 model year.